Provide comfort for the family of Louise Greene with a meaningful gesture of sympathy. 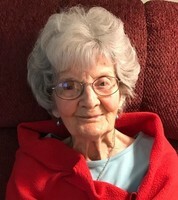 Louise Marie Greene, 99, of Boothbay, ME, died peacefully and surrounded by love on February 8, 2019 at St. Andrew's Village Gregory Wing. She was the beloved wife of the late Fred S. Greene to whom she was married for 51 years until his passing. Louise was born in Elmsford, New York on October 17, 1919, daughter of the late Nicholas and Rose (Rossano) Pandolfo. Louise and Fred raised their family in Mt. Kisco, N.Y. and retired to Glastonbury, CT. Louise later moved to Boothbay, ME., where she shared the home of her loving and devoted daughter and son-in-love Sandra and Robert Abernathy. After retiring, Louise spent many years volunteering for a variety of organizations, giving her time and talent in any way she could right through the end of her life. She touched many lives through this work but gave of herself without need for a thank you and with gratitude for the life she was given. Her great-grandchildren Sadie and Luca Abernathy were the light of the last decade of her life. She loved to spend time playing with them, hearing their stories, and looking through pictures and watching videos of all their activities so that she never really missed being part of their daily lives. In addition to Sandra and Robert, Louise is survived by her adoring grandson and granddaughter-in-love Robert and Megan Abernathy Jr., and their children Sadie and Luca who all miss her deeply. Louise is also survived by daughter Dawn (Jack) Dring and grandchildren Jodi (Frank) Modder, Jeffrey (Katie) Dring and their daughter Cecillia, Daniel Dring, and Matthew (Carly) Dring. A private celebration of life will be held later this spring. The family would like to thank the staff of St. Andrew's Gregory Wing for the wonderful care she received during the year she resided at the facility as well as the Hall Funeral Home (Boothbay, ME) and Mulryan Funeral Home (Glastonbury, CT) for their assistance since her passing. Donations are being accepted for: ST ANDREWS AUXILIARY (ST ANDREWS HOSPITAL AUXILIARY). Provide comfort for the family of Louise Marie Greene by sending flowers.